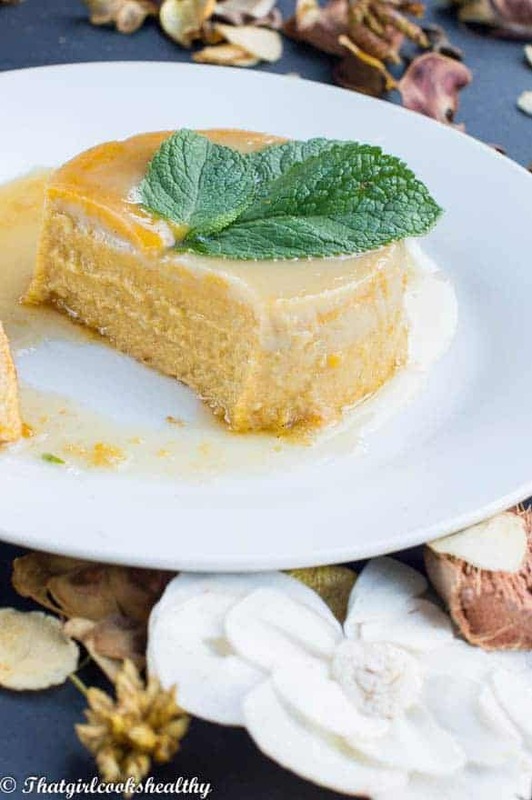 Flan de calabaza – A Puerto Rican dessert, a flan made from pumpkin puree with spices that’s baked in a water bath. Perfect to serve for thanksgiving. 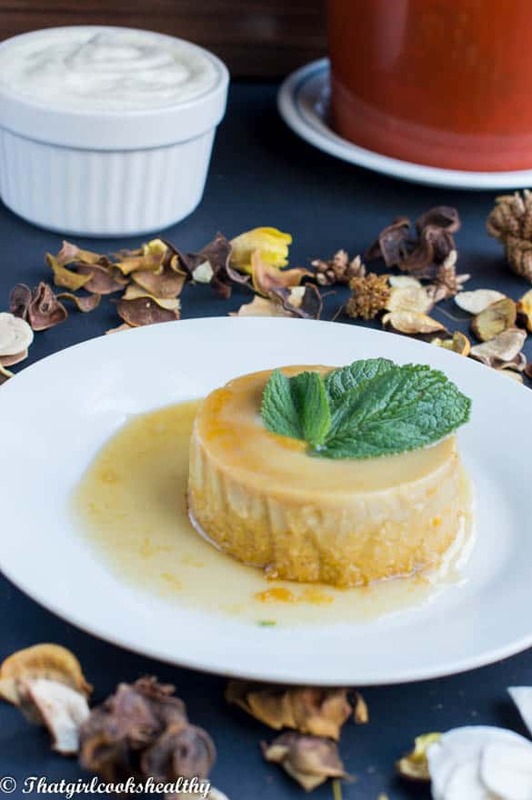 Flan de calabaza is simply a Caribbean style custard dessert with a soft caramel topping. Calabaza is a type of squash from the islands that can be easily replaced with regular pumpkin or even butternut squash. I’m not a huge fan of puddings that consist of a large quantity of eggs, now that I think about it, my lack of enthusiasm stems from a negative experience as a youngster at high school. School dinners were the bane of my life, I used to hate eating from the canteen and would beg my mother to fix me some of her tasty food instead. The cakes and dessert at school were always bland, soggy and definitely not edible. One day I had this sweet treat made from custard, unbeknown to me it was pumpkin flan. The dessert was a burnt, eggy mess to say the least and ran over all my plate. Clearly the darn thing wasn’t cooked to perfection, I had no idea what and where things went wrong. One thing I knew for sure is that you couldn’t pay me enough to eat flan ever again and so my disdain for pumpkin flan grew. Fast forward as a mature woman, things are a little different from my high school days. I have come to fully embrace all the sweet and spicy tones from flan de calabaza. 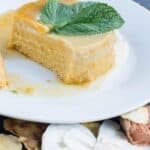 My version of this latin American dessert has it’s own unique flare, using coconut milk in replace of evaporated milk and coconut condensed milk as opposed to the dairy kind. 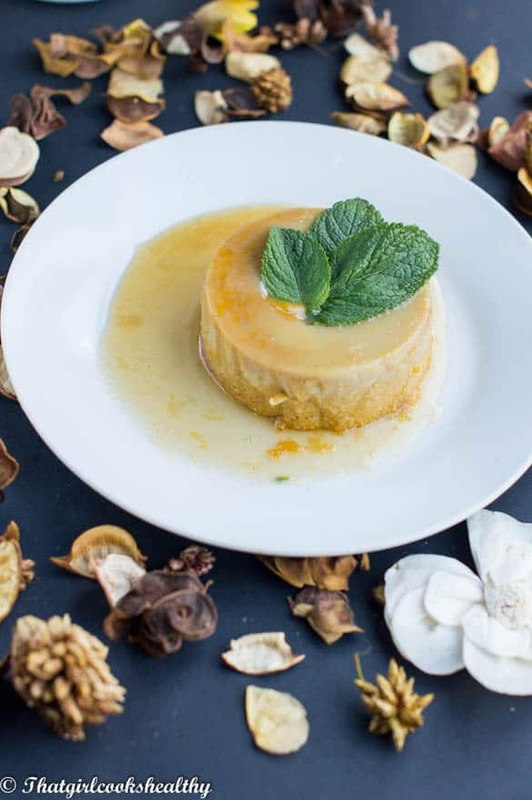 This is a wonderful sweet fix for readers who love flan that’s free from dairy and soy free. The key to creating the perfect flan is to not overcook it to the point of skin forming on top and at the same time master the art to not undercook to omit the risk of creating a runny collapsible mess. While five eggs may seem like overkill, but trust me, we are good to go with five, anymore would lead to a strong egg taste. The right amount of spice is important to balance the eggs with the spices – 1/2 tablespoon of pumpkin spice is just right. Try to use small ramekins approximately 9cm, that’s the size I used. You want sizeable ramekins that are easy to manoeuvre. The larger the ramekin the more likelihood of the flan sliding or falling apart, so take note. Before we commence with the bath water baking, start by preparing the base of the ramekins with caramel (boiled coconut sugar with water). As you can see from the above picture, the ramekins all have a small amount of caramel inside, feel free to swirl from side to side. Prepare the water bath by adding hot water to a deep roasting pan, DO NOT add the ramekins after – please do be careful with this step and handle the pan with care. As the pudding begins to bake in the oven, do not neglect, check, check and check often – you want the flan to cook and set thoroughly (remember not to over or undercook). 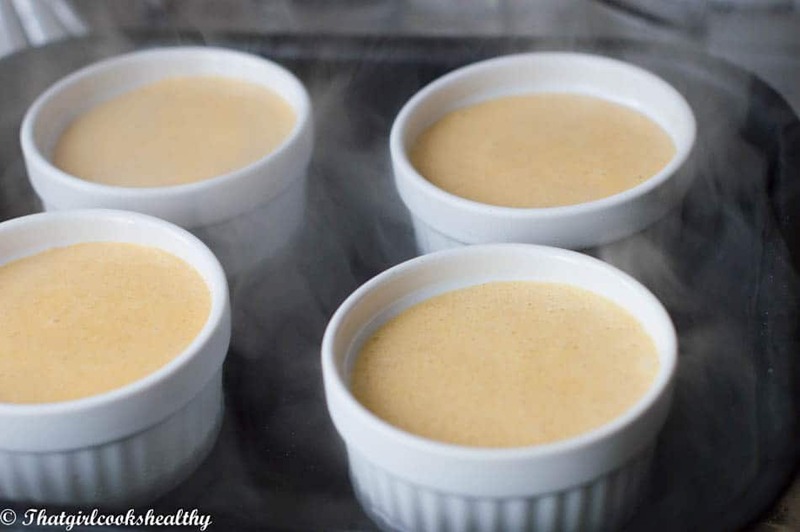 Once the flan is cooked and set, allow the ramekins to cool down in the water prior to removing. Pumpkin pie spice mix – 2 tbsp of cinnamon, 2 tbsp of nutmeg, 2 tbsp of ginger and 1 1/2 tsp of all spice – use 1/2 tbsp worth of this mix and store the rest. Start mixing the sugar and water in a saucepan on medium heat. Stir the sugar water for 1-2 minutes and set aside, it will begin to thicken up as it cools down. 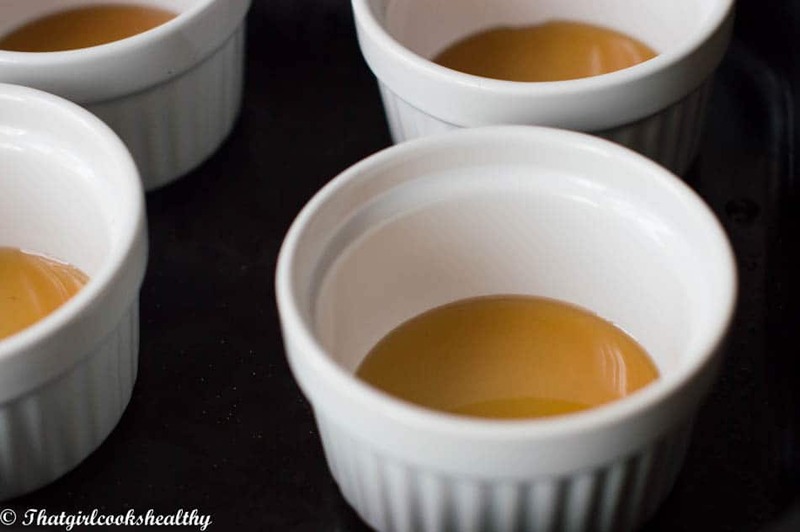 When cooled, pour a small amount of caramel into each ramekin and swirl around. Then transfer the pots into a large roasting pan with hot water filled halfway. Crack and beat the eggs in a large bowl, add the milk, spice, vanilla and pumpkin puree. Pour everything into a high speed blender and liquidise to ensure the pumpkin puree has completely broken down. Double check the previous step by straining the mixture to omit any lumps. Bake in the water bath for up to an hour or until set. Once cooked, allow ramekins to cool before removing from the water bath. Run a knife around the edge of each ramekin and invert onto a rimmed plate. I think you just made me want to make this ! How amazing does this flan look! I know you like your sweet treats Imma and I hope you get to sample this flan. Wow. I really feel like I hit the jackpot finding your blog! My son and I are dairy free, we love new flavors. I love pumpkin so I’m looking forward to this! Happy to have helped and looking forward to your feedback.